Тайна третьей планеты / El misterio del tercer planeta /The Mystery Of The Third Planet avi. 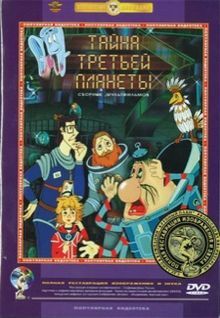 Заголовок сообщения: Тайна третьей планеты / El misterio del tercer planeta /The Mystery Of The Third Planet avi. The film was adapted twice for the US market. It was first brought over as a video release in 1987, with dubbed voices. The second time, it was released in the 1990s as part of Mikhail Baryshnikov's "Stories from My Childhood" series. This series consisted of films that were bought by California-based company Films by Jove from Soyuzmultfilm for the international market. Over $1.5 million was spent by this company restoring the prints, adding new music and redubbing the films with American actors. This version of the film was named Alice and the Mystery of the Third Planet and has been released on VHS as well as on a 1999 DVD collection with several other films . The film has been released on DVD several times (the latest release, which featured rather misleading cover art, was in October 2005 ), but there is currently no version which preserves the original Russian voices and music and also has English subtitles. The Films by Jove version of the film has been criticized by some of those who saw the original for adding many extra dialogue lines, shortening the film, and replacing the unique synthesizer music by Alexander Zatsepin. Заголовок сообщения: Re: Тайна третьей планеты / El misterio del tercer planeta /The Mystery Of The Third Planet avi. Пыталась-пыталась скачать, потом забила в поисковик - и, о чудо! - данный мультик имеется на ютубе.